Universitatea Valahia din Târgovişte, Romania / Valahia University Targoviste, Romania is a 25 years old state university which appearance was determined by objective requests of Romanian Higher Education Development, decentralization of the huge university centers, but also, by the existence of the valuable human potential and old cultural and historical traditions in Dambovita Region. 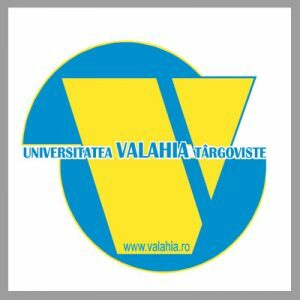 Nowadays, UVT structure comprises 10 faculties and 3 departments that propose 34 bachelor degree specializations (long-term courses of 3 or 4 years), 34 master’s degree programmes (courses of 1-2 years), 6 doctoral studies directions, but also teacher training courses and distance / lifelong learning courses. At present, around 7000 students attend all forms of study under the competent guidance of approximately 300 teachers, organized in 19 educational departments. As a sustainable university, UVT creates – through education – citizens aware of the changes required by a new way of leaving who act on the economic, social, cultural and informational environment, in order to create a human society capable of long-term development. At the moment, UVT is actively involved in the realization of a multicultural Europe and contributes to the affirmation of its human and democratic values. The institution acted/acts as coordinator or partner in various national and international projects, in the frame of different programmes. At international level, projects under the European frameworks like TEMPUS, Socrates, LLP, Erasmus+, FP7 etc. contributed not only to develop the potential and the scientific expertise of the staff, but also to increase the European cooperation and awareness. By its large connections with the pre-university system, the University ensures the continuous professional development of in-service teachers in all the areas which ensures also the preparation of pre-service ones. In addition, most of the continuous professional development programmes have been organized with the means of modern didactic methodologies and e-learning facilities. In this respect, the mission and the tasks of the institution come in accordance to the project activities and tasks, being oriented on developing teacher training programme, to foster the development of social, civic, intercultural competences and strengthening the European cooperation and awareness. UVT acted as coordinator or partner of many national and international projects. Some of them had a crucial role on promoting new teaching methodologies and pedagogical strategies, as the institution was a pioneer in developing and undertaking continuing professional development programmes for Romanian teachers, having as subject new orientations in education, including the development of learning activities in formal / informal / non-formal settings. 1) FP7 – SiS.2013.2.2.1-1 project 612269: “ENGAGE – Equipping the Next Generation for Active Engagement in Science” (2014-2017) (https://www.engagingscience.eu/) – VUT as partner – experience and expertise in designing curriculum materials based of IBSE strategy and RRI dimensions, which offers to students the opportunity of self-expression and responsibility for taking informed decisions. A particular MOOC interface was built (edX) for providing the training.